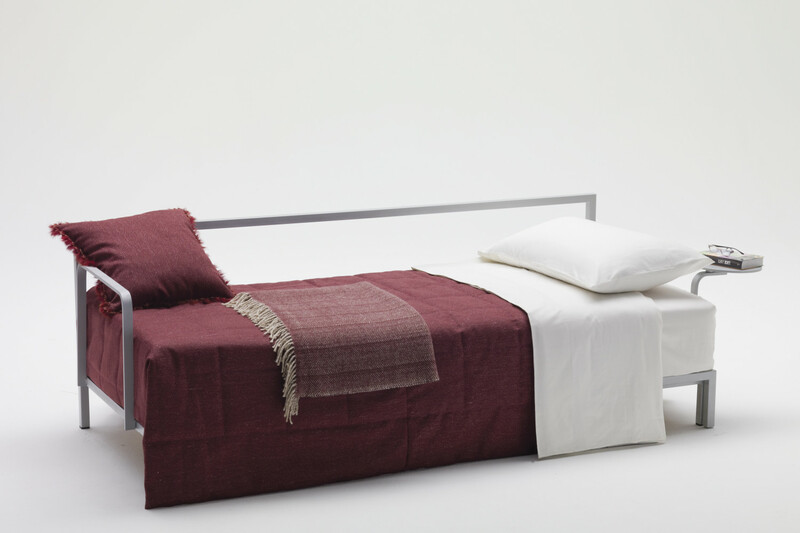 Willy Side is a sofa bed with metal armrests that opens on the short side: this mechanism allows to limit the bed dimensions using the space available in width and not in depth. 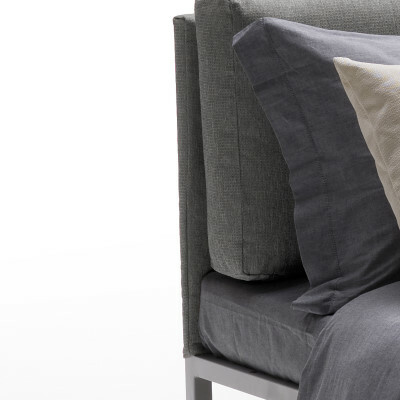 This space saving sleeper sofa does not contains one bed only, but two: you just have to remove the backrest cushions to obtain a single bed ready to be used. 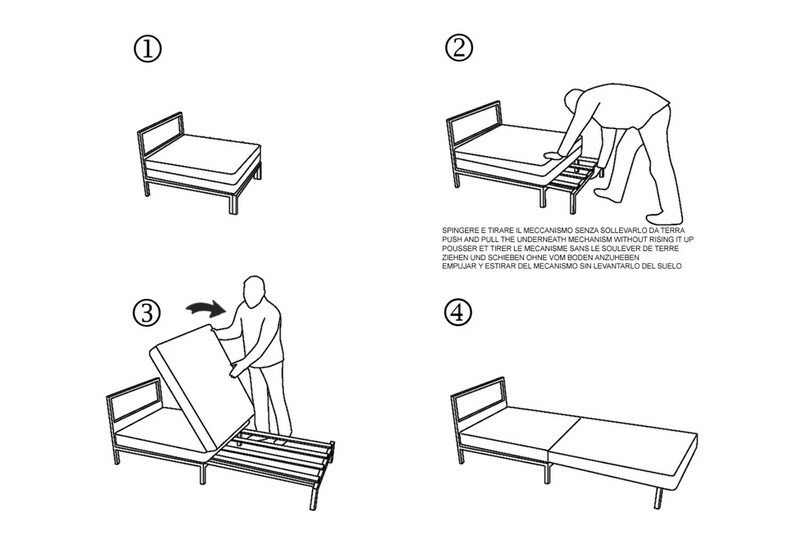 The double bed is easy to open as well; thanks to the Lampolet mechanism you only have to pull the bed base toward yourself and unfold the mattress. 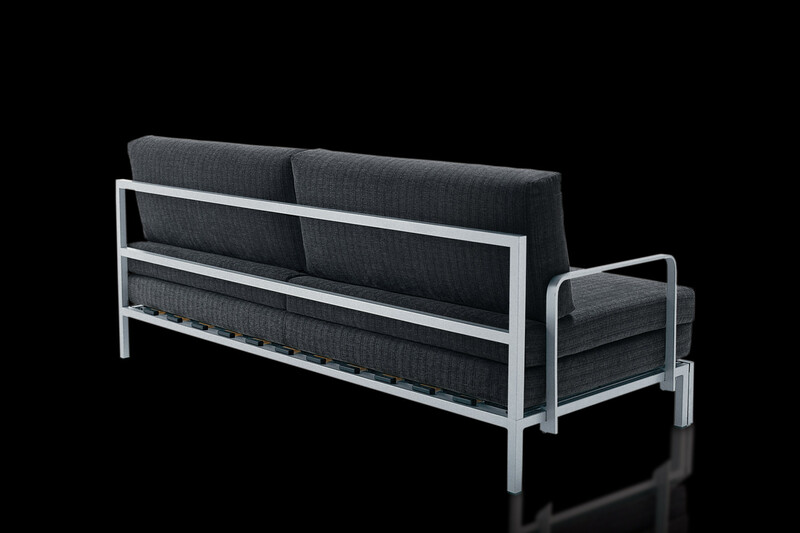 This convertible sofa is characterised by modern and simple lines, with a visible embossed metal structure. 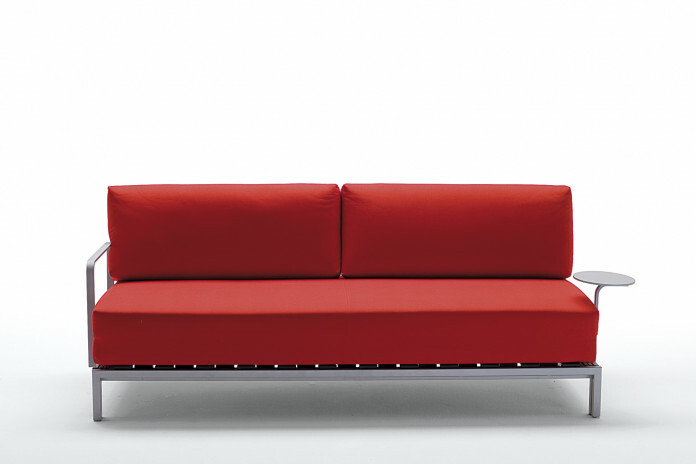 The sofa can be chosen without armrests, with slim armrests or with a swivel tray. Willy Side is ideal for small spaces, contract environments, studio flats and holiday apartments. 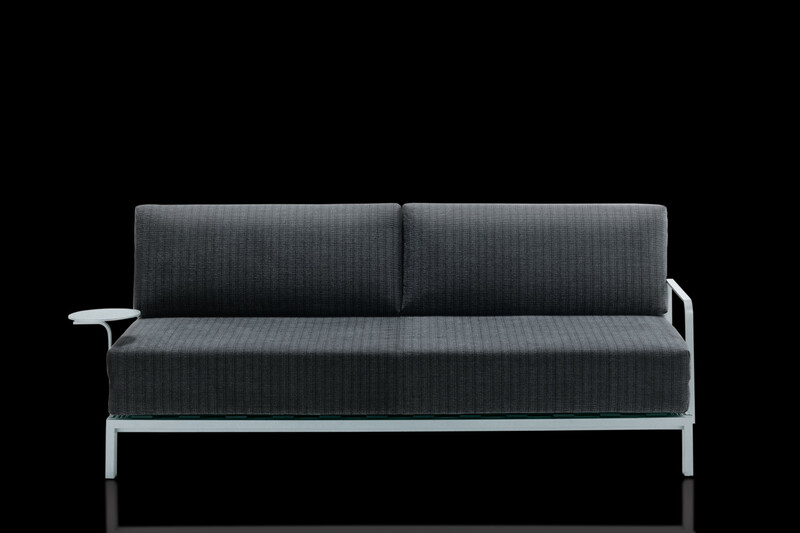 The sofa bed is equipped with a resilient polyurethane foam mattress, with a height of cm 11 (double) or cm 22 (single). For more details see the dimensions table. 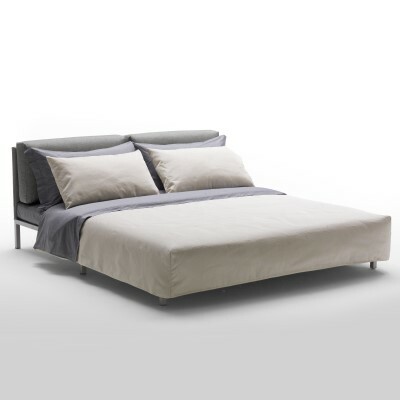 The sofa bed is available in fabric, eco-leather and leather in all the colours displayed in the Milano Bedding samples page. Willy Side is available without armrests, or with metal tray and armrests that can be combined in several ways, and positioned on one or both sides. Mechanism: high resistance furniture tube, oven coated with epoxy powders in an embossed aluminium colour. 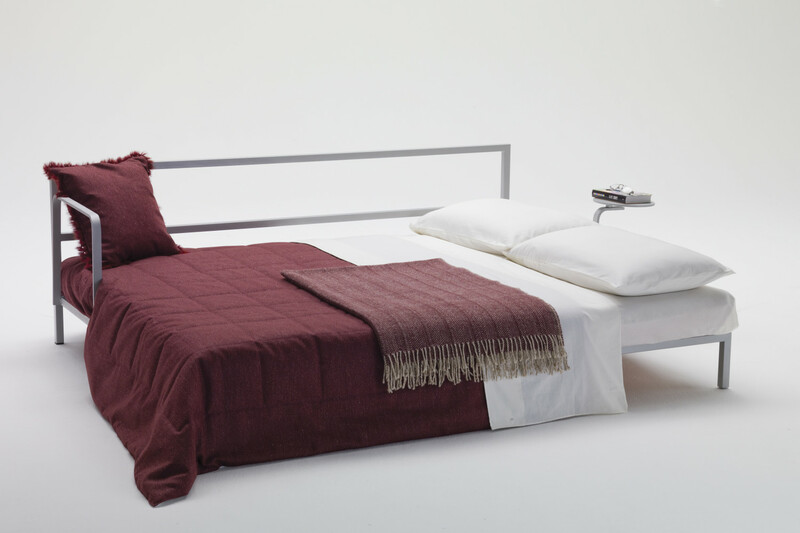 Orthopaedic bed base. Mechanism opening and closing in one time. Mattress: 35 kg/m³ expanded polyurethane with removable cover in polyester/cotton cloth combined with 100 g/m² resin fibre. 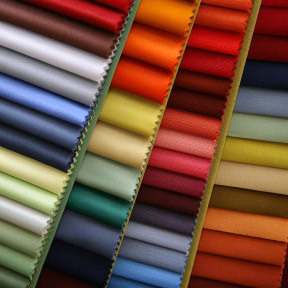 Fabric as per attached sample and 100% cotton fabric quilted with 100 gr/m² 100% polyester wadding. Backrest: 21 kg/m³ expanded polyurethane covered with 400 gr/m² thermo-bonded needled fibre and cotton cloth. Bed Base: slats in curved steamed beech plywood. Padding: 100 g/m² silicone polyester wadding. 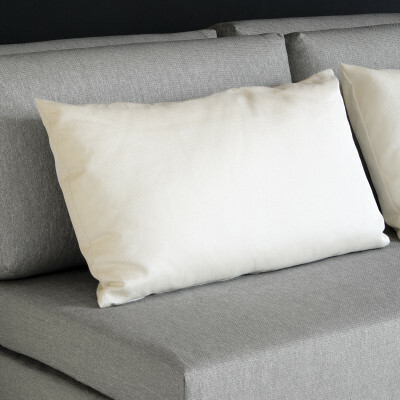 Headboard cover (optional): 100 gr/m² resin fibre combined with polyester/cotton cloth. Armrest, Tray (optional): high resistance furniture tube, oven coated with epoxy powders in an embossed aluminium colour.